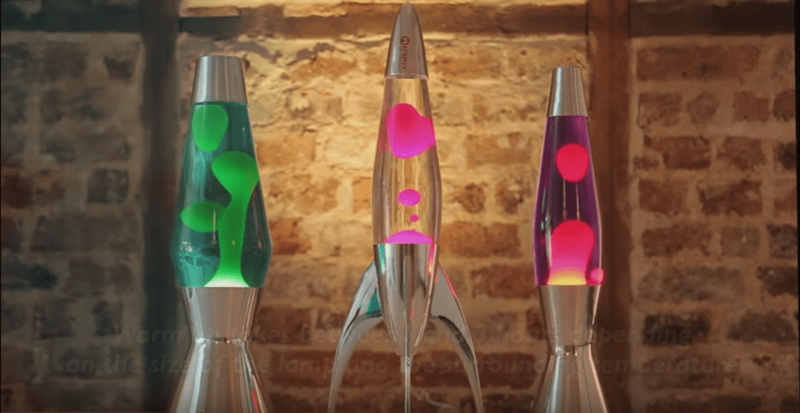 Lava Lamps are liquid motion lamps, which have existed for many decades. The lamps feature two liquids that cannot dissolve in each other but with closer densities. For example, water and oil do not dissolve in each other. Nevertheless, the densities between the two are very different. As a result, the two cannot form a lava lamp. To make a lava lamp, you have to search for liquids that are insoluble and closer in density. Now, mix the two liquids and apply some heat at the bottom of that mixture. Bulbs are usually the heat source in most liquid motion lamps. As it heats up, the heavier liquid expands and the density reduces. The heavier liquid becomes lighter suddenly and rises. As the liquid rises, it cools and becomes denser again. It sinks as a result. That happens in slow motion due to the heat absorption. The dissipation is also a very slow process and the density changes are slight. But if you do not want to go the do-it-yourself way, the following are the Lava Lamps to consider. If you are looking for a lava lamp that will accentuate your home décor’s vibe or that will complete the interior of your home, consider the size. The Lava Lite 6851 is likely to serve the purpose. Due to the product’s impressive height, which stands at 27 inches, the capacious that holds bubbling wax and clear liquid and a 100 watts incandescent bulb, the lamp utterly suits the most spacious and the largest living rooms. Even more, it will set the right mood and uplift the spirit with bewitching play of changeable lights of various colours. Rhode Island Novelty 212 provides nightlight suitable for kids and you can therefore include the lamp in your toddler’s room. The lamp will infuse the room with ambient lighting, make a nest atmosphere and captivate restless kids. The first thing you are likely to notice during your purchase is its rocket shape and the shape is likely to catch your kid’s eyes. The scarlet red bubbles inside the glass globe move in quirky magnetizing ways to delight your eyes. The Lava Lite 6851 looks fantastical when placed insider a dark room – it will perfectly enchant your child and soothe him/her to sleep faster when they gaze at it. It is also worth mentioning about your safety when using the lamp. The lamp has already passed all the safety tests and has received Underwriters Laboratories approval. Therefore, you will have nothing to worry about during installation in your kid’s bedroom. You have to connect the lamp to the wall socket. Rhodes Island Novelty 212 features an electrical cord to allow plugin operations with the inline switch. You can therefore switch it on and off without necessarily disconnecting it from the power source. With the scarlet red and black classic colours and elongated shape, the lamp can fit in various room interiors and add enticing accents to any room décor. People use lava lamps for decoration and therefore when looking for a lamp, you should go for a model that complements and adds graceful touch to your home’s interior. The Lava Lite 2124 might be a great consideration for beginners. The lava lamp is available in a relatively small size as it has a 4-inches diameter and 14.5 inches height. However, the product offers enchanting colourful solutions plethora and combinations of wax, liquid and housing. The extensive colour range allows lava lamps enthusiasts to find a lamp that suits their preferences. The original artistic designs will captivate and please adults, teenagers, kids and toddlers of any age. Even more, you can use the lamp as an originality gift to a family member or a friend. When looking for elusive unobstructive decorative element that you can include in your small-sized room, the 11.5-inch Lava Lite 1993 Model should be your first consideration. The Lava lamp works as a fashionable decoration for almost every small room, dorm, study room or office. It will also function well as a nightlight on the bedside table. Despite its compact dimensions, the colour and design schemes of the lamp are not different from those of the large models. The aluminium base – symmetrically complemented by the matching top – features classic silver colour and offers a study foundation for the entire lamp. The manufacturer uses heat resistant and shockproof glass to make the glass globe that holds the white wax that quaintly flows inside the blue liquid. The manufacturer advises users to remain patient and offer the lava lamp sufficient time – up to six hours – to warm up after purchasing it. Immediately the lamp starts heating up, it forms wax pillars that resemble quirky stalagmite. After thorough heating, the wax starts forming bubbles that slowly flow, collide and ooze in beguiling patterns. When planning for theme nights or organizing throwback parties – possibly back to the 1960s or 70s – the Lightahead Glitter Lamp might be your most ideal choice. The lava lamp will uplift the spirits in addition to setting the mood and lending a retro vibration to your gathering. The magical product is one variation of iconic lava lamps but boasts different cylinder-shaped designs and alternative filing. Its sparkling silver glitter that replaces the common heavy slowly moving wax is very light and flows effortlessly up and down in the glass, which houses orange liquid. The glitter’s movement is very captivating such that it will enthral your guests and fill your room with hypnotizing splendour and hypnotizing shimmering lights. To drum up the downright dynamite party, pair the Glitter Glow Lamp with disco balls, complement it with vintage vinyl records and space it with unforgettable throwback tunes. In addition to being a fantastic decoration during your party, the lamp will add energizing and positive vibes in your everyday life. You can place it on the bedside table to work as a nightlight.